Overnight Monday Night: Damaging wind gusts until midnight, clearing sky. Lows in the 20s, wind chill around zero. Tuesday: Blustery but bright. Highs in the 20s, wind chill around 10. 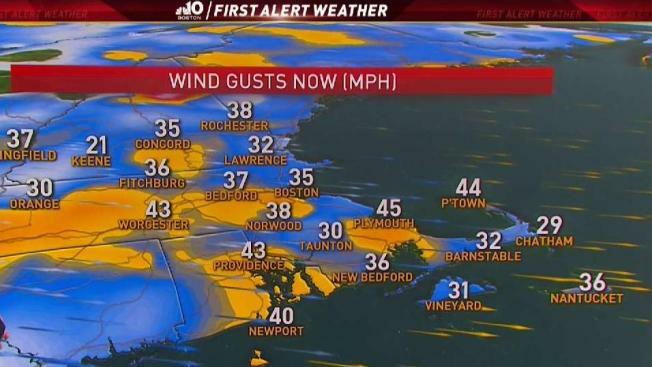 Heavy wind continued to present a threat across New England Monday. Peak gusts have been between 50 and 60 mph widespread across southern New England. Isolated spots have approached the 70 mph speed, with widespread damage and tens of thousands without power. The wind will stay strong through Monday evening and overnight, slowly subsiding around midnight. Our First Alert remains in effect through Monday night because of the wind as we expect more damage and outages. Temperatures fall to the teens overnight, and with the gusty wind, our wind chills will be around zero. Tuesday will be blustery and cold, with highs in the 20s. We remain dry into Wednesday with increasing clouds and snow in the evening, and with highs in the mid 20s. A clipper system moves in from the Great Lakes and will bring a few inches of snow for southern New England Wednesday. The snow accumulates Wednesday night into Thursday morning for the commute into work. That's why we have a Frist Alert for Thursday. Another possible wintry mix moves in Friday night, with a larger area of low pressure moving through Saturday. This is when the forecast becomes uncertain, as different models have different scenarios. We may experience more gusty wind this weekend behind the precipitation, but the strength is also too early to call. Drier weather is expected for the start to the first week in March, with highs in the low to mid 30s.